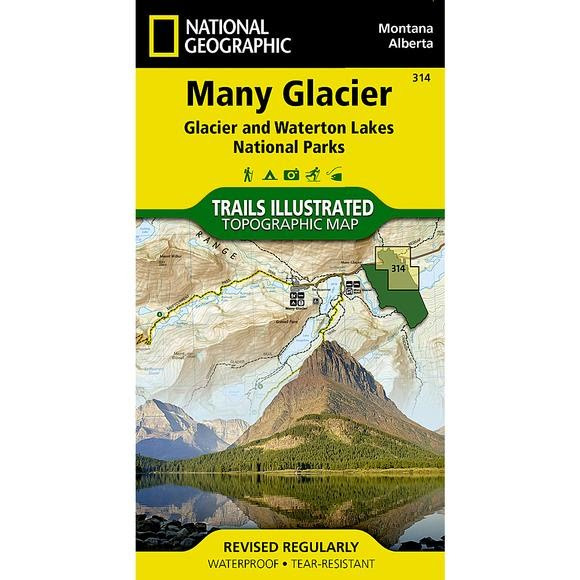 Created in partnership with local land management agencies, National Geographic's Trails Illustrated map of Many Glacier, Glacier and Waterton Lakes National Parks offers unparalleled detail for outdoor enthusiasts exploring the pristine landscapes contained within these two spectacular parks. Created in partnership with local land management agencies, National Geographic&apos;s Trails Illustrated map of Many Glacier, Glacier and Waterton Lakes National Parks offers unparalleled detail for outdoor enthusiasts exploring the pristine landscapes contained within these two spectacular parks. This expertly researched map features key areas of interest including Many Glacier, Upper Kintia Lake, Rising Sun, Saint Mary Lake, Belly River, and the Waterton Lakes. The Many Glacier map can guide you off the beaten path and back again with hundreds of miles of mapped trails including portions of the Pacific Northwest and Continental Divide trails. The map base includes contour lines and elevations for summits, passes and many lakes. Helpful information about recreation activities available in the parks, regulations, and snow and water hazards are included as well. Recreation features are clearly marked, including campgrounds, mountain bike trails, waterfalls, picnic areas, and horse rental locations. Other features found on this map include: Glacier, Lake Sherburne, Lewis Range, Livingston Range, Lower Saint Mary Lake, Mount Cleveland, Saint Mary Lake, Upper Waterton Lake. Measurements 37.75" x 25.5", Folded: 7.5" x 4"